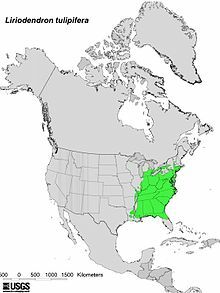 Most of the eastern United States, from Massachusetts west to Illinois, Arkansas and Louisiana, south to the Gulf Coast and central Florida. Yellow Poplar trees reach heights of 160 feet with a diameter of 8 feet. It is probably the tallest hardwood tree in the eastern US. General: Yellow Poplar sapwood is white, sometimes with stripes, while the heartwood is usually tan, but can range from greenish brown to dark green, purple, black, blue and yellow. The wood is straight grained, uniform in texture and moderate to light weight. Among commercially important hardwoods in the US, it ranks in the lower third of the range of the following properties: specific gravity, bending strength, toughness, impact resistance, work to maximum load, crushing strength, fiber stress at proportional limit, shear strength, tensile strength and side hardness. Working Properties: Yellow Poplar has the reputation of being one of the easiest of all hardwoods to work with hand and machine tools. It works well in planing, turning, gluing and boring. It is average in mortising and nail and screw holding abilities. It is poor in shaping and sanding. It holds stain and paint well. Uses: Lumber, veneer, pulpwood, furniture, plywood, interior finish, dimension stock, gunstocks, musical instruments, toys, novelties, hatblocks, sporting goods, pallets, shipping crates, slack cooperage, particle board.